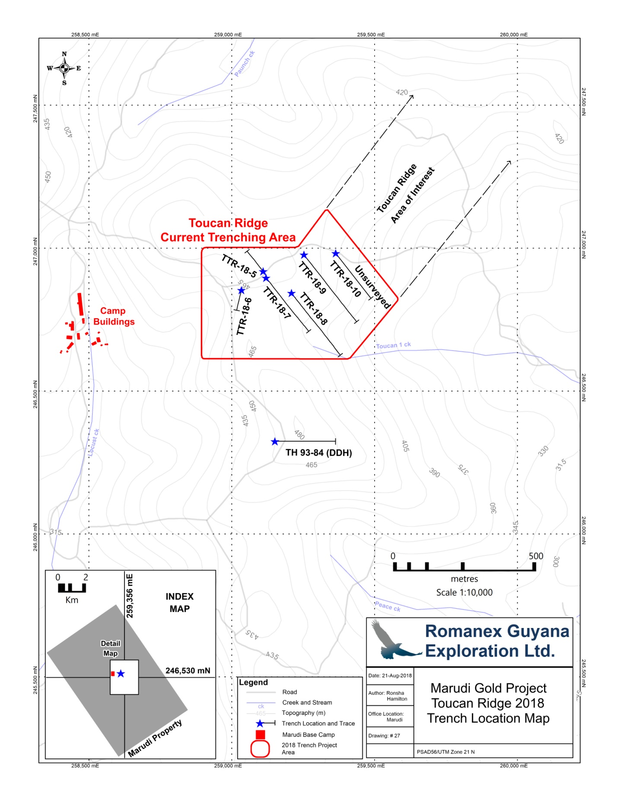 September 13, 2018 - Vancouver, Canada - Guyana Goldstrike Inc. (the "Company" or "Guyana Goldstrike") (TSXV: GYA, OTC: GYNAF, FSE:1ZT) is pleased to report initial assay results from Trench TTR-18-7 at the Toucan Ridge area on its Marudi Gold Project ("Marudi" or the "Property") located in the Guiana Gold Belt, Guyana, South America. The results have been added to the "Table of Significant Gold Assay Results" below.- Additional samples are pending from trench TTR-18-07 and will be released once received and reviewed by the Company. "Our mandate via the investment by Zijin's Global and Midas Exploration Funds earlier this year is very clear - to explore and develop Marudi for additional hard rock ounces to add to the Company's existing resources. To this effort, our trenching program has explored four of the nine identified areas of geological interest for the discovery of gold, with Toucan Ridge currently under exploration. Further results from Toucan Ridge are pending for trenches, TTR-18-06, TTR-18-07, TTR-18-08, and TTR-18-09. 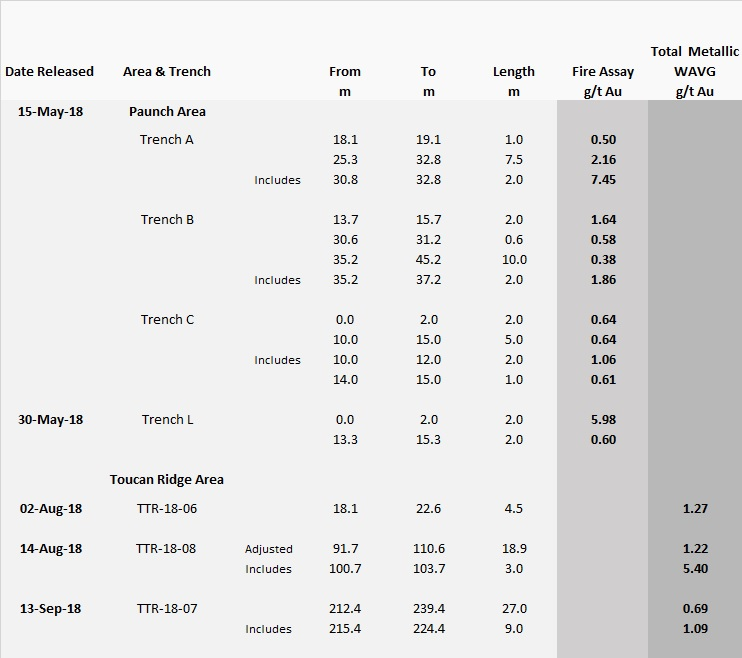 The geological team is continuing to prudently step out and trench along the ridge's area of interest with the current sampling and mapping of trench TTR-18-10." Please see below a map of the Toucan Ridge area of interest and trench locations. Also see "Highlights of Historical Drill Results - Mazoa Hill Zone, 2012" below, for select drill assays. A total of 1128 metres of trenching has been completed in the Toucan Ridge area. 390 samples have been taken. The exploration team will continue along the ridge progressing in an eastward direction with each new trench site stepping out roughly 50-100 metre intervals, mainly perpendicular to the ridge. The area of interest continues for more than 1.75 kilometres to the east of the first trench - TTR-18-05. Trench sites are planned where quartzite-metachert is exposed or interpreted to occur beneath the transported overburden. The eastern part of Toucan Ridge is approximately 400 metres south of the Paunch area which was trenched in May and returned the Company's first significant gold discovery. Please note all drill assays above represent intercept and are not true width. The Company is developing the Marudi Gold Project located in Guyana, South America. The project has an 18-year mining license in good standing, all-season road access, infrastructure in place, with an established camp serviced by employees, service buildings, and a full-time camp manager. The Property has three known gold bearing areas: the alluvial areas, the saprolite, and the underlying hard-rock.